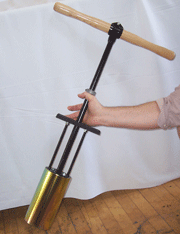 To set that putting green cup just right, you may want this professional style golf hole cutter. Designed to create minimal soil disturbance to protect the grass roots. Hot-rolled tubing cutter with carbon steel shaft and sturdy ash handle. Creates the perfect hole time after time.